Paul Weller started life fronting the wildly influential new wave group, The Jam (1976 – 1982), then moved in to a smoother soulful/ jazzy/R&B sound with the Style Council (1983 – 1989). He heavily influenced the guitar-based Britpop movement of the 1990s and since that time has been a successful solo artist. I was lucky enough to see his show last week. Not only do I dig his music, I appreciate Paul’s sense of style – he is one of the best-dressed musicians on the planet. Never ostentatious, trendy, or outlandish, his style is simple, distinctively British, and always well done. The mods were obsessed with clothing and style and wore skinny, tailor-made Italian suits with short jackets (dubbed “bum freezers”), button-down shirts, Chelsea boots or “winklepicker” long-toed shoes, and military parkas to keep everything clean as they drove their Lambretta scooters, and popped speed while listening to the Beatles, the Who, the Rolling Stones, and Small Faces, leaning into blue-eyed soul and R&B sounds. One source calls Mods “ice-cold, up-to-the-second hipsters”, so trying to make a show on a modest savings was difficult for a young style-conscious teenage boy from Woking, Surrey, a small city 25 miles from London. I had to really save for my first Ben Sherman. We used to buy Brutus shirts, which were much cheaper – second best. But Ben Shermans were the sought-after item. The first one I ever got was a lemon-yellow one. I must have been 12, 13, and it was a bit too big for me. But being a kid I didn’t realise you could take it back to the shop. I wore it till it fitted me. He says that shirt meant everything to him and speaks at length about his love of Ben Sherman shirts, how the line’s aesthetic strikes him, the colours, and their “statement of intent”. That really sums up Paul’s style – beautiful clothes worn with intent; for him, style is “like a code in my life, a religion”. The skinny mohair or shark skin mod suits of the 60s worn by the soul artists Weller listened to were adopted by The Jam in the 70s, their signature black suit-white outfits echoed the black and white colour contrast that dominated the new wave period. It was during this time when Weller began to discover the pleasures of bespoke suits. 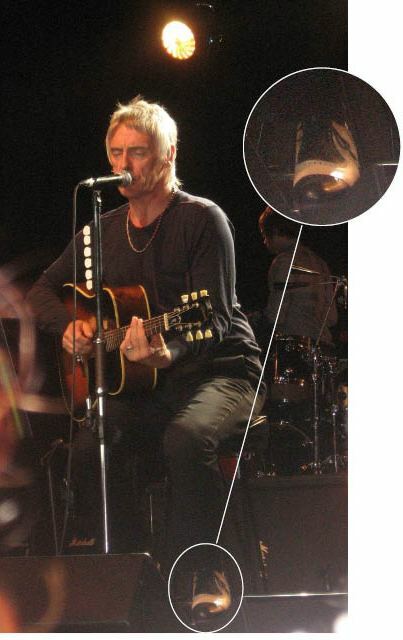 Weller adds interest to his toned down stage gear with an interesting shoe. 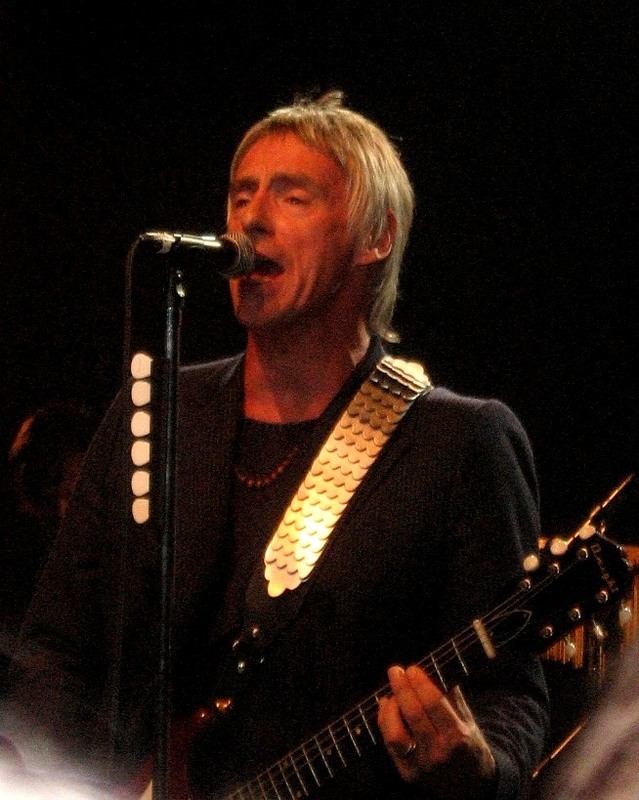 It was during the Britpop movement that Weller earned the name “Modfather” – his Jam and solo work were hugely influential to the biggest names of the period: Blur, Lush, and Oasis. Through his work with Liam and Noel Gallagher of Oasis, Paul and Liam recognized their mutual love of clothing. Now, Paul is guest-designing for Liam’s clothing line, Pretty Green, an excellent line of Mod-influenced gear for men (that happens to be the name of a Jam song). In his wardrobe, you would find five double-breasted pinstripe suits because as he says, “you can’t really go too far wrong with a pinstripe”. He stresses that a jacket fit well in the shoulders and to buy suits according to your body shape. For Weller, it’s the details that count – he’s always wearing an interesting pair of shoes and a silk stuffed into his breast pocket. All that while rocking an iconic textured Mod haircut. Paul Weller’s haircuts, like his clothes, have always stood out. He has been wearing variations of the mod haircut for years. I asked Dubliner, Aaron O’Brian, stylist at Kearns & Co. in Toronto about Paul’s specific and distinctive cut. The mod style paved the way to many different hair and fashion styles. “The mod basically gave people the freedom to express themselves and experiment with fashion,” Aaron says. That’s Entertainment is a classy early video (1981) featuring The Jam in tailored mod gear. Beat Surrender, The Jam’s last single. Paul sticks to the stovepipe mod-style trousers and simple sweater – check bass player, Bruce Foxton’s skinny sand-coloured suit. Wake Up The Nation (2010) from Paul’s solo career features his cool, simple, and distinctive tastes – a tailored jacket and neck scarf for a bit of punchy interest. Paul has been a constant in my life without knowing it. I am among countless fans who wish to claim the man for my own–a musical visionary and certainly one very special reason why I wish I were a proper Mod. And, if not for Weller, I would not have discovered the great joy of the Small Faces, early Who, the whole Immediate Records label and just the wildly cool style he embraces. He’s a handsome cat, too. Next Thursday. Nagoya. I am there!